A question I get a lot lately. Since my whole Unique Technology Platform is wrapped around Google Apps, I think I should talk about what it is Google Apps and how it works for your business. Do you have a Gmail account? Your Gmail account is your Google account. It gets you into all of Google’s great tools. If you have a Gmail account and click on “Account Settings” you can see what Google Products your signed up with. Google has a ton of Products like Google Docs, Google Maps, Google calendar and more. Now if you have a Google Apps account you will have the same access to most of these products plus other 3-rd party “Products”. YES – APPS are PRODUCTS!!! So instead of having yourname@gmail.com – Google Apps gives you Yourname@yourwebsite.com. This email account becomes your Google Account and allows you to access all Google’s Apps and Apps from other 3rd party companies. For self-employed professionals we want things to be easy. Imagine if you have subscribed to five different services for you company. Each service has a different login. Well google apps fixes this. You have one login. That is your google account. So if I want to check my invoices at Freshbooks I login with the same email and password I would to check my email at gmail.com. This means less username and passwords to remember. What about those Google Products? 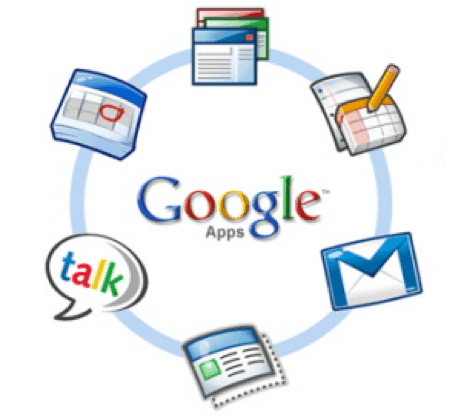 The basics for Google Apps are Email, Calendar and Docs. There are some others but these are the most used. Email is Gmail. Calendar is you personal calendar and you can customize it how you like. Docs will allow you to write documents, spreadsheets, presentations and more. But it doesn’t stop there, you can collaborate with people on the documents around the world. That means you can write-up a business proposal in Google docs and send it to your partner half way around the country. Then both of you can edit the same document at the same time, seeing each others changes in an instant. Something that does all this must cost a fortune. Google Apps has two versions! A free version that is a great start for most self-employed and small business professionals and then a Business version that costs $50 a year per user. The paid version comes with support. The best thing about Cloud services like this is you are dealing with Support right from the company that provides the services. That’s right, you get Google Support and not a computer consultant! Plan it! You can’t just use this product. You need to configure it properly or you will never receive email. I recommend to get someone install this for you, show you all the features and how this product can make your business grow. I of course do such a service with Your Unique Technology Platform. But of course you can google and find many qualified people to install this great tool. Remember most of these people who install Google Apps, will just install it leaving you scrolling through help documents and not going through all these wonderful features. If you have any questions please contact me on Google Apps or any other Technology Platform question.